Emirates Airline Ready to Say "Ahn-Yung-Ha-Say-Yoh"
Emirates cabin crew in action at the first "Soul of Korea" training workshop held in Dubai last week. Dubai-Seoul service will commence in May, 2005. Determined to ensure its cabin crew exceed the expectations of Korean passengers and are equipped to provide Emirates' trademark attentive service on the upcoming Dubai-Seoul flights, the airline is taking steps to educate its cabin crew on the unique Korean culture. In February, Emirates invited two professors from Seoul's Kwangju Women's University, both of whom specialize in airline service, to instruct Emirates' senior cabin crew in the finer points of Korean customer service expectations and the nuances of good service, Korean-style. The three-day workshop conducted in Dubai was titled "Soul of Korea," and it is the first of several to follow, as the senior crew members will soon pass on the knowledge to their colleagues through similar training workshops. In addition, Emirates' over 5,500 cabin crew members will each receive a specially-produced DVD containing an introduction to Korea, Korean customs, and information on how to interact appropriately with Korean passengers. Said Terry Daly, Emirates Senior Vice President for Service Delivery: "Culture plays an important role in human interaction, influencing customers' perceptions and expectations. 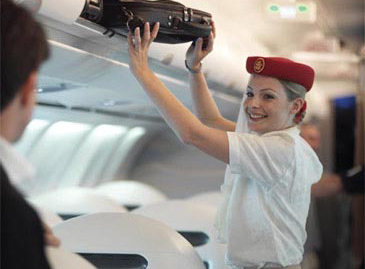 Emirates' objective is to provide the best possible service on every route. These training initiatives will help sensitize our crew members to cultural differences and enable them to better serve the needs of our Korean customers." Emirates currently has 200 Korean cabin crew, and plans to recruit more in the coming months. The airline also plans to have a minimum of three Korean nationals on each flight to and from Seoul. Emirates' Korean crew members are part of the most cosmopolitan cabin crew in the world with over 90 nationalities represented. 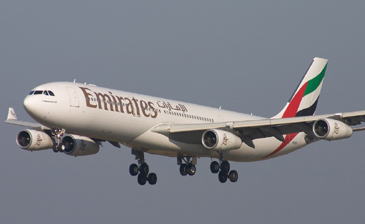 Emirates will launch daily non-stop flights between Dubai and Seoul's ultra-modern Inchon International Airport on May 1, 2005, operating the Airbus A340-300 in three-class configuration for the route, with a capacity of 267 passengers and 13 tons of bellyhold space for cargo. Emirates, the Dubai-based international airline, flies to over 70 majors cities in in Europe, the Middle East, the Far East, Africa, Asia and Australiasia. Starting from June 2005, Emirates will also fly to North America. The the official international air ways of the United Arab Emirates (UAE) is one of the fastest growing airlines in the world and has received more than 200 international awards for excellence since its launch in 1985. The Emirates Airline fleet now consists of over 50 air planes, including 28 Airbus A330-200, nine Boeing 777, and 12 larger 300-series Boeing 777 aircraft. Emirates Airline also plans to have in its fleet, the Airbus double-decker A380 by October 2006. The Dubai International Airport is currently constructing a complete terminal dedicated to Emirates Airlines flights, which should be complete by 2006. Onboard an Emirates Airline airplane, each passenger has his or her personal TV, which has six to 18 channels, along with the usual audio channels. When passengers travel in First or Business Class, they are offered a film library, in which they can choose between a selection of titles and watch them on their own in-seat personal video player. 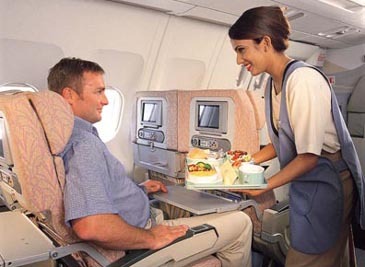 Emirates Airline's flight attendant serves a customer. Emirates Airlines sponsors various festivals and events held in Dubai, including the Dubai Shopping Festival (DSF), Dubai Summer Surprises (DSS), Dubai World Cup (horse racing), Dubai Desert Classic (golf), and the Dubai Tennis Championships. Emirates Airlines is striving to provide international links between Dubai and the world, as well as to contribute to the development of Dubai as being the Middle East's commercial centre and aviation hub. Emirates Airline has its own frequent flyer program known as Skywards, which is shared with SriLankan Airways.